Again, a look that can be categorized as typically SF. Not so Euro-chic, but très urban-hip. In her fuzzy white vest, paired with a studded black leather belt, she was reminiscent of a Burner riding the Esplanade. 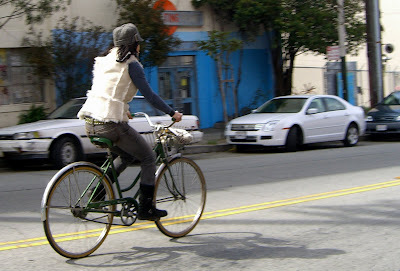 Also noteworthy are the grey cap with side buckle, tucking in her pigtails, and green vintage Schwinn!